Art deco style light on a building on Franklin Street. A beautiful picture! It looks nearly like a prehistorical animal, although I perfectly recognize the Art Déco style of the object. 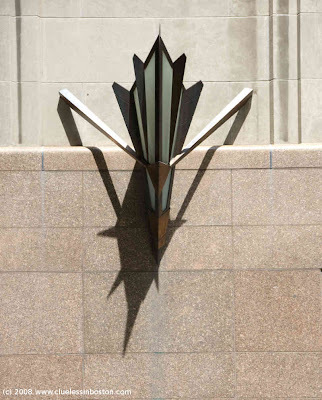 Art deco triffid. It does look like it's about to pounce form the building. I love the strong shadow contrast you've captured. Art deco really was the coolest of all architectural styles. Love to see it come back. Have you ever played the video game Bioshock? Completely set in an underwater art deco world. Worth a play if you ever have the time.